Wellcome on my personal website! I'm Marco Bellino a Freelance Symbian Developer from Turin, Italy. In this website you can find some hobbyist software I developed during these years. Everyday, I receive a lot of emails, unfortunately due to my limited spare time I can't reply to all of you. You can find answers to most of your questions looking at the website, and reading the FAQ section. It is also possible to hide IconHider's icon itself. In that case, in order to access again to IconHider you'll need to dial a personal code and IconHider will immediately appear on the screen. The FULL version can hide up to 20 icons and you'll be able to set you own personal code as you wish. Take a look at the IconHider page to download immediately the TRIAL version for your Smartphone! All the 3rd FP1, 3rd FP2, 5th, S^1, S^3, Anna, Belle devices are supported. 3 December 07 - The subscriptions to the Guardian 3rd Edition - Beta Testing program are finished, many thanks to all for your great partecipation! During December 1000 testers will be selected from all the received subscriptions and they will receive the first Beta versions. If all will proceed without any particular problems the final version will be publicly available on January 2008 on a new site reserved to the software. During December month, there will be two website updates every week. Visit This Page on Thursday and on Sunday to keep yourself constantly informed about the software development progress and to know the interesting features that will be included in Guardian 3rd Edition. Next update is scheduled for Sunday 30 December. - New: Integrated a cleaner to remove previous versions. - New: Confirm Message after writing Donation Code. - Improved: General code improvements. - Updated: Changed all the UIDs to avoid conflicts with a very old beta version. 23 July 07 - You'll be happy to know that I've just started the 3rd Edition version development. Please, do NOT email me about, I will not have time to reply you. All furthers details will be announced as soon as possibile. Who wants to participate to internal Beta-Testing, can apply using the form available Here. Only submissions containing real user data will be taken into consideration. Special Greetings to P@sco for providing all the Graphics. If you want to suggest new features or request some improvement, you can ask it using This page, NOT via e-mail. - Fixed: Opening a Read-Only file throws an Exception "not a 3rd edition file"
17 March 07 - SISXplorer 1.0 has been Released. SISXplorer integrates Explorer like features for sis archives (3rd Edition) with the powerfull of a Theme Viewer (Temi 3rd Edition). - Check that the 3rd Edition Programs will not install suspicious or dangerous files. - Deeply Inspect the content of each file using the Integrated Hexadecimal Viewer. At this time, the software is able to manage 3rd Edition sis only. If the project will be sustained from users, I'll continue the development adding new cool features and adding the capability to manage 2nd Edition sis also. 4 December 06 - Little Software Update. In the 2.0 version, the internal uninstall procedure, sometimes, wasn't working propely, I suggest to anyone to update their Guardian to 2.1 version. Now Guardian is available also in Spanish, Turkish, Russian, Dutch, Czech, Chinese, Arabic and Ukrainian! 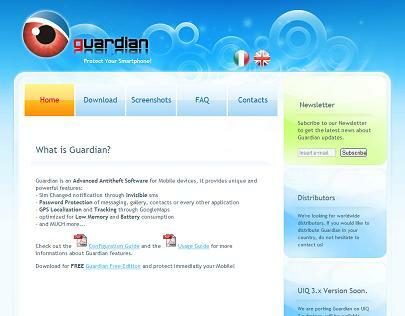 1 December 06 - Guardian 2.0 has been released. Guardian is the new antitheft system for your Symbian Series 60 device. - Guardian is all this and much more... Discover the others Guardian's Features! Guardian is the exaple that is not needed to be a big Business Company to develop a great software. I did all this, on my home-desktop pc, during my spare time! 24 October 06 - UnlockMe! has been Released, a new software totally Freeware. UnlockMe! is a software that will allow you to recover the "Unlock Code" actually configured in your mobile phone. 8 August 06 - From now on, is available the MoneyBookers service for making donations. People who lives in Countries not supported from PayPal service (eg. Russia), can now use MoneyBookers! After updating, you'll have to insert again the "Donation Code" you already have. Now I'm adding new features to Guardian and developing a new plugin: FORWARD. This plugin will allow to retrieve the last sent/received sms, last made/received phone numbers calls and retrieve numbers from the phonebook. 22 February 06 - FlashSMS is finally available for download, the site will be updated soon to give a complete description of software. The users who will contribute to the growth of the project with a donation will be able to select the number from the PhoneBook and send the sms to Multiple Recipient. 1 February 06 - Guardian: the final antitheft system for Symbian Series 60 Phones (n90, n70, 6680, 6630, 6600...) is available for download. 1 February 06 - www.symbian-toys.com is online, from this site you can download the softwares I've developed. All the softwares are donationware and if i'll get enought support from the users they will have a long future.